Before the Saturday morning session of General Conference, Dale treated me to one of his family's traditions...making crepes. We used Dale's special crepe pan and tools provided by the wonderful Aunt Shirley. Dale is certainly the crepe pro, but he encouraged me to try my hand at making my first-ever crepe. I'm happy to say it turned out quite well thanks to my excellent teacher. What made the crepes extra delicious was what we put inside them. The night before we made Aunt Shirley's favorite lemon curd recipe from Ina Garten, better known as the Barefoot Contessa. Note: the recipe calls for 3 lemons but Aunt Shirley uses 4 so that's what we did too. After a late night trip to Walmart to replace our food processor, the curd couldn't have turned out better. 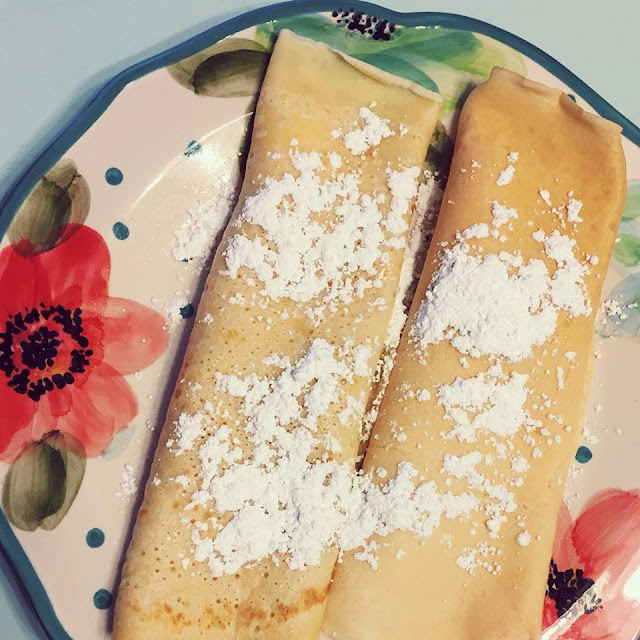 To balance out the lemon curd's sweetness, we also added some ricotta cheese to our crepes. It was the perfect combination of flavors. After only two crepes each, we were both quite full. We made enough crepes to have them again on Sunday morning. Dale and I have decided that making crepes is going to be our new tradition for April General Conference. Now we have six months to determine what culinary masterpiece we will attempt for October General Conference. Cooking together is so much fun!